Having a primary Storage Server 1 and a secondary Storage Server 2 is not so bad. But what if the primary storage fails? It means lots of work and possible a little (less than 4h in my case) data loss. That’s why an HA Storage Cluster should be build. There are many options to do so. Usually an HA Storage Cluster is something more expensive than a car. So the question came up how to build a cheap HA Storage Cluster. This cluster should be able to load balance iSCSI volumes and of course keep them at high availability. For the beginning the cluster should be based on two nodes, which each should have about 2TB space for iSCSI on 15k SAS disks. And about 4TB space for data on SATA disks as well as up to 5TB space on SATA disks for backups. The normal file shares should be kept available by using DFS. As software solution for the HA Storage Cluster I’m thinking of Windows Server 2008 R2 and Starwind iSCSI software. On the Hardware side there need to be new cases, mainboards, raid controllers etc. 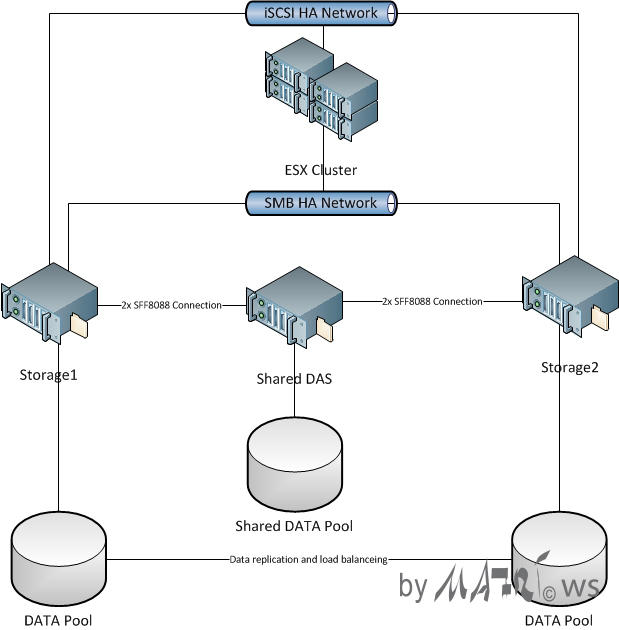 A sketch of the idea behind the HA Storage Cluster.